It's probably impossible to discuss this book without discussing its means of production. Though it would be interesting to discuss it as a purely standalone book, its strange genesis will always influence anything you can write about. 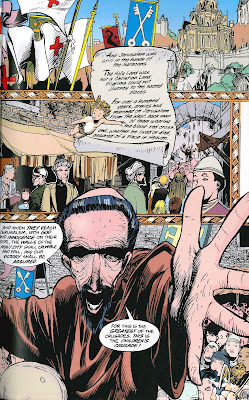 The Children's Crusade was a 1993-94 "annual" crossover, by which I mean a crossover through annuals of ongoing series (like Eclipso: The Darkness Within or Armageddon 2001), not a crossover that took place annually. 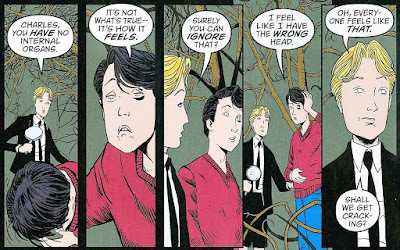 It was Vertigo's first and last attempt at such a thing, spanning Black Orchid, The Books of Magic, Swamp Thing, Animal Man, and Doom Patrol. 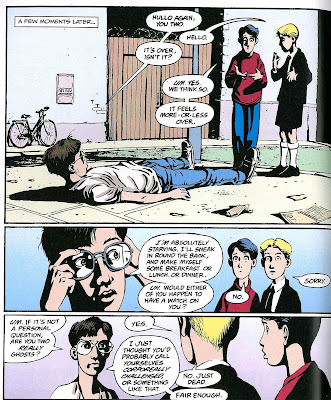 In addition to those five issues, it was bookended by issues featuring Charles Rowland and Edwin Paine, the so-called "Dead Boy Detectives" from The Sandman, which were (mostly) written by Neil Gaiman. The crossover has never been collected, I guess because the middle parts didn't make a lot of sense on their own, and didn't connect into the last issue in the way they were supposed to. But because printing Neil Gaiman is like printing money, DC has finally collected the bookends he wrote, commissioning a new middle chapter by writer Toby Litt and artist Peter Gross to bridge the gap between the two Gaiman-penned issues, covering all the ground needed to get you from The Children's Crusade issue #1 to issue #2. Litt and Gross also add extra pages to the closing issue, I guess to clarify or expand rushed aspects of it. I actually meant to scan a different sequence of panels on the facing page, but I messed up and I'm too lazy to redo it, so this'll have to do. 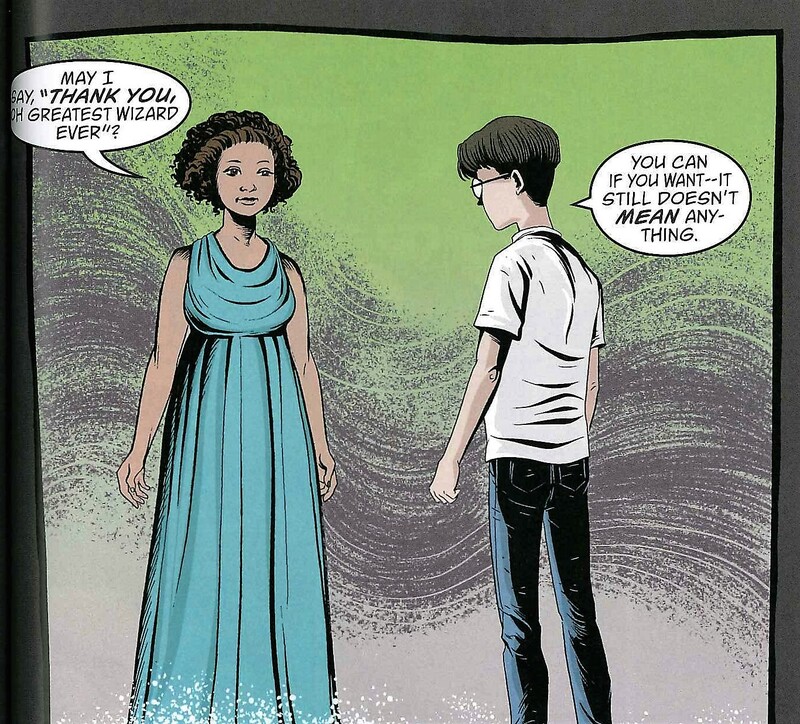 The opening issue is Neil Gaiman at his most typical and his best, aided by Chris Bachalo and Mark Barreiro on art. Charles and Edwin, the two boarding-school ghosts who eluded Death in Season of Mists, have set up a detective agency, finally answering a long-standing point of bafflement for me. Their first case is brought to them by a girl whose brother has vanished, along with every other child in their village, plus a huge number of children the world over. 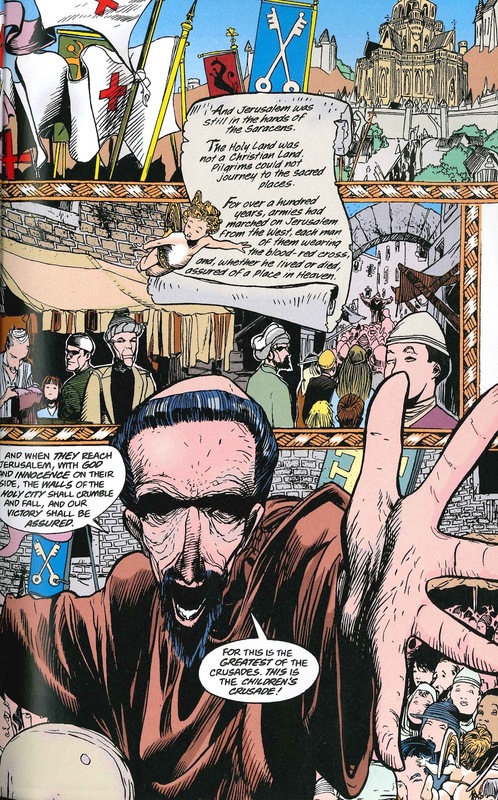 In typical Gaiman fashion, though, their investigations (such as they are; they're delightfully poor detectives) are interspersed with tales of lost or missing children from throughout history: a chronicle of the Children's Crusade, a boy telling the Victorian poet Robert Browning about the Pied Piper's visit to the town of St. Cecile, and a very grim story of how a group of children trapped in a pit managed to escape. Well, that's delightful. You can always count on Gaiman for some whimsy. The investigations of the Dead Boy Detectives are fun: they're always attempting to map genre tropes onto everything that happens (Edwin from Sherlock Holmes, and Charles from film noir), and I enjoyed their encounter with the enigmatic and confusingly named Wat. But the interspersed tales of lost children are the highlight of the issue, and really, the whole book. Bachalo uses confined panel layouts for the Dead Boy Detective parts, with as many as 25 panels on a single page, which works well to capture the shifting, strange conversations. But it also highlights the sprawling lushness of the interpolated narratives, which use huge panels with curved edges and figures that violate the panel borders, and really just go all out. A lot of Gaiman's comics works is a triumph of tone more than anything else, and issue #1 of The Children's Crusade is some of his best work in that regard. 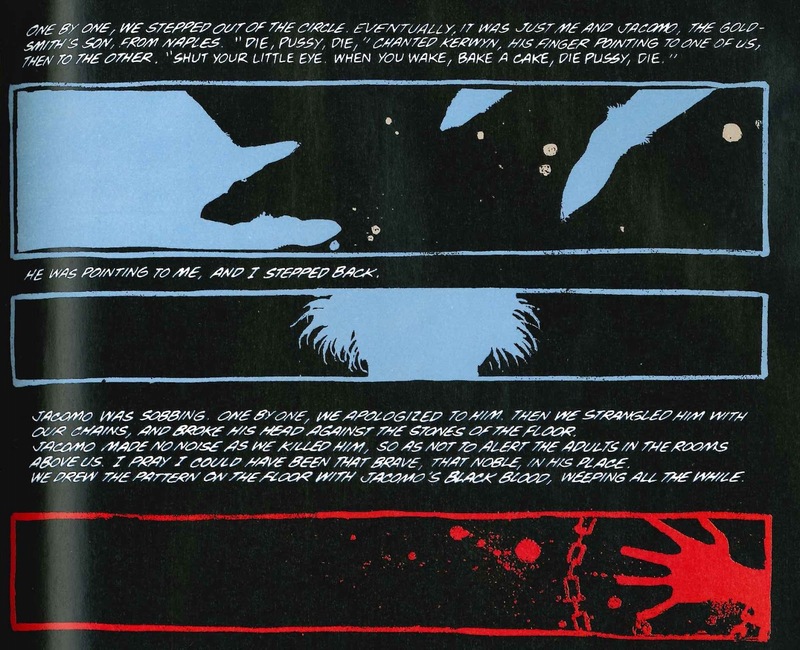 Gaiman and Bachalo capture the awfulness of being a child; at the same time I was reading this, I was reading Olive Schreiner's The Story of an African Farm, and Gaiman's portrayal of how the innocence and powerlessness of childhood can be terrifying fits right in with that. Bachalo and Barreiro's art is 1990s Vertigo at its best, full of detail and dark inks. 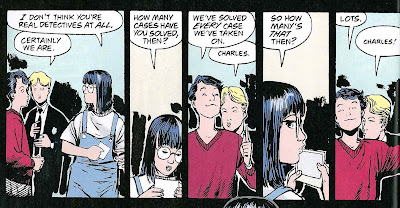 Near the end of the issue, Charles and Edwin discover a list of powerful children being targeted by the mysterious forces of the Free Country: the children who at the time of publication (co-)starred in the various Vertigo titles. This kicks their investigation into high gear: these children, if they haven't already disappeared, hold the key to where all the other ones have gone. This leads into the new Act Two, where the High Council of the Free Country goes out and picks up the kids from each Vertigo title; what was originally five different annuals is now one shorter story by Toby Litt and Peter Gross (Rachel Pollack and Al Davison are also credited, but it's unclear to me what they contributed). The success of this is somewhat mixed, especially when you read the last bookend issue. 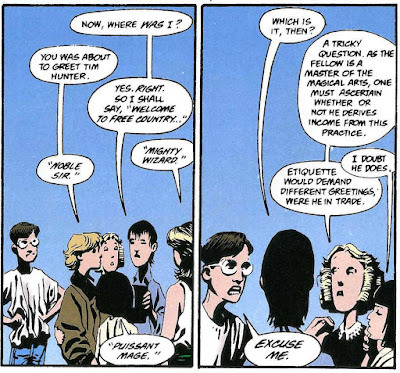 We are shown the collection of Tefé Holland from Swamp Thing, Suzy from Black Orchid, and Maxine from Animal Man in detail, but we don't really see the recruitment of Dorothy from Doom Patrol or Tim Hunter from The Books of Magic. In the last chapter, the inability of the Free Country to hold onto Dorothy and Tefé is a plot point, yet that's not actually depicted here, while it seems like it ought to be. Tefé is recruited in this act, and in the next one, she's just gone. In some ways it seems a waste of Peter Gross's talents to just get him to imitate Chris Bachalo (and why couldn't they just hire Chris Bachalo to imitate Chris Bachalo? ), but he's impressively good at it regardless. Meanwhile, Charles and Edwin continue their investigations. I don't know if they were in the original stories this new Act Two is replacing, but their adventures are pretty pointless here: they arrive too late to help Maxine, visit a diner, have a dream of the Dark Tower (which will be important in the last chapter), and encounter a couple members of the Free Country High Council. Some of this seems like set-up, such as their meeting with the creepy Jack Rabbit, but it then plays no role in the last issue. And Toby Litt and Peter Gross's handling of Robert Browning's death journey to the Dark Tower he once wrote about lacks the grandeur I think Gaiman and Bachalo would have given it. Gross is a good artist (he illustrated much of Lucifer), and he does a good job aping the way Bachalo drew Charles and Edwin, but it's a little too obviously the very sharp artwork of someone working with computers in 2015, not by hand in 1993-94. He kind of gets away with it here, but it's a little jarring in the final chapter, when the Litt/Gross pages are interspersed between ones drawn by Peter Snejbjerg in 1994. Maybe it's an obvious gag, but I dig it. The last issue is a real mixed bag. Parts of it are good shading into great. I loved Tim Hunter materializing in the Free Country while its High Council is so deeply debating how to greet him that they don't notice that it happened. I liked how everyone was expecting him to be some amazing, all-powerful wizard but he'd only cast one not-particularly-good spell before. 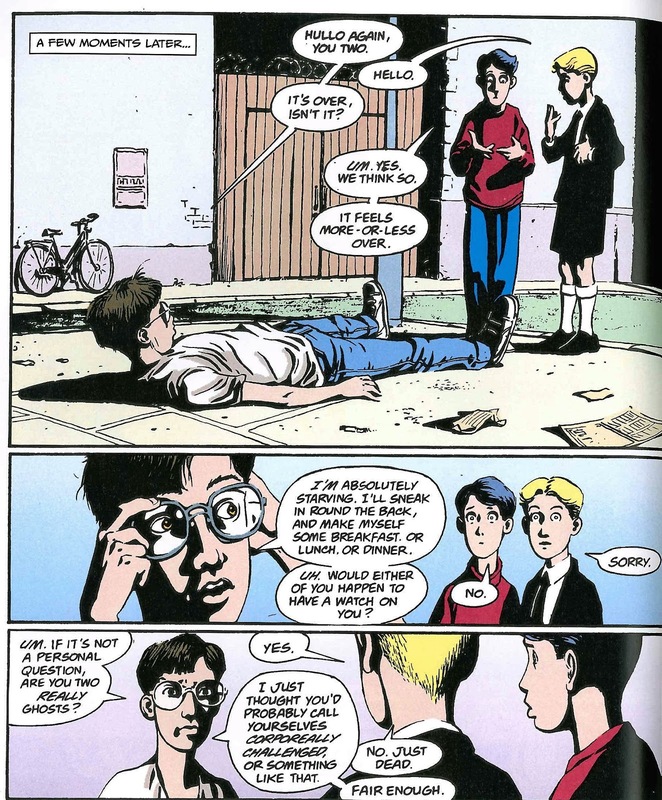 I was amused at Tim's declaration that things like this probably didn't happen to John Constantine. I enjoyed how Suzy (the junior Black Orchid) adopted Tim as her boyfriend and followed him everywhere. I especially liked the dysfunctional team created by Tim, Suzy, Charles, and Edwin. I thought it was funny that Oliver, the boy the Dead Boy Detectives were originally hired to find, turns out to an uncooperative brat. And I laughed at Tim's eagnerness to break up the nascent partnership at the end. It's the ending that really falls apart. I don't know if this is Toby Litt's fault, or something from Neil Gaiman's original work he couldn't fix; Gaiman's Sandman work often fell apart in the conclusion, in my experience. Tim meets the personification of Free Country, who is decrepit because she's straining to hold so many children, but then she's revitalized, and suddenly Charles Rowland is possessed by the Dark Tower and the villain is revealed and defeated. Why does any of this happen? It all seems completely random, and then the story is over, with none of our protagonists actually having done anything to end it. You're sort of unwittingly summing up this whole issue, Tim. There are some nice touches in the three epilogues, such as the way humanity decides to cover up the disappearance of so many children ("The CIA wanted to put out that the whole thing was a pan-global recruitment program, rather like National Service, and that the children had to be rendered without prior warning because otherwise some parents would have employed tutors to prepare their kids for the tests. After some consideration, this was dismissed as suggesting an unprecedented amount of international cooperation.") or the Dead Boy Detectives' resolutions for handling their next case. But the big, mythic story set up in the first issue pretty much fizzles away with the conclusion here; nothing matches the grandeur of the interpolated stories Gaiman and Bachalo told in the first part. Keen-eyed readers will note that the "A FEW MOMENTS LATER..." caption is a later interpolation, lettered by Todd Klein on computer in 2015 as opposed to John Costanza by hand in 1994. This is enjoyable on the whole, but it still doesn't cohere the way one might expect given all the new writing Toby Litt did. I'm really curious about the original version of the whole crossover now; I'm sure I'll pick it up used someday so I can compare it. In Two Weeks: A return to the House of Secrets!